Happy 20th Anniversary Very Large Telescope! 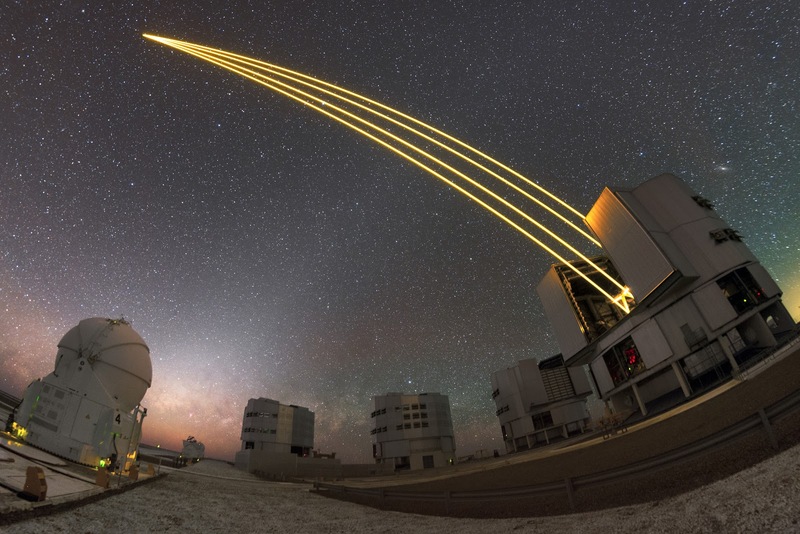 One of the Unit Telescopes of European Southern Observatory's Very Large Telescope (VLT) is producing artificial stars in the skies above the Atacama Desert, above the Milky Way. In May 2018, the VLT celebrated 20 years of operations. The Four Laser Guide Star Facility (4LGSF) shines four 22-watt laser beams into the sky to create artificial guide stars by making sodium atoms in the upper atmosphere glow so that they look just like real stars. The artificial stars allow the adaptive optics systems to compensate for the blurring caused by the Earth’s atmosphere and so that the telescope can create sharp images.